A constant irritant in Soviet–U.S. relations was the overflight of the Soviet Union by American U-2 spy aircraft. 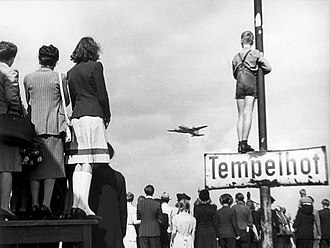 On 9 April 1960, the U.S. resumed such flights after a lengthy break. The Soviets had protested the flights in the past, but had been ignored by Washington. 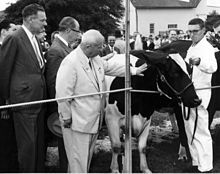 Content in what he thought was a strong personal relationship with Eisenhower, Khrushchev was confused and angered by the flights' resumption, and concluded that they had been ordered by CIA Director Allen Dulles without the U.S. President's knowledge. On 1 May, a U-2 was shot down, its pilot, Francis Gary Powers, captured alive. Believing Powers to have been killed, the U.S. announced that a weather plane had been lost near the Turkish-Soviet border. 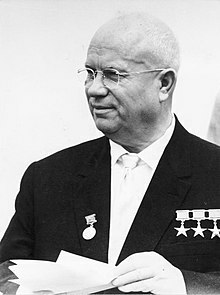 Khrushchev risked destroying the summit, due to start on 16 May in Paris, if he announced the shootdown, but would look weak in the eyes of his military and security forces if he did nothing. 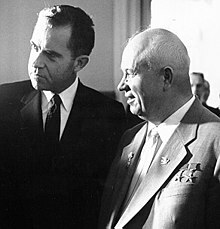 Finally, on 5 May, Khrushchev announced the shootdown and Powers' capture, blaming the overflight on "imperialist circles and militarists, whose stronghold is the Pentagon", and suggesting the plane had been sent without Eisenhower's knowledge. Eisenhower could not have it thought that there were rogue elements in the Pentagon operating without his knowledge, and admitted that he had ordered the flights, calling them "a distasteful necessity". 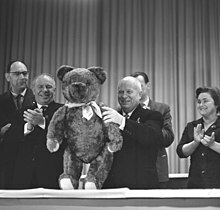 The admission stunned Khrushchev, and turned the U-2 affair from a possible triumph to a disaster for him, and he even appealed to U.S. Ambassador Llewellyn Thompson for help. After completing his takeover of mainland China in 1949, Mao Zedong sought material assistance from the USSR, and also called for the return to China of territories taken from it under the Tsars. 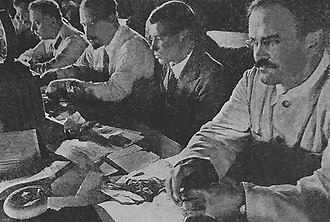 As Khrushchev took control of the USSR, he increased aid to China, even sending a small corps of experts to help develop the newly communist country. 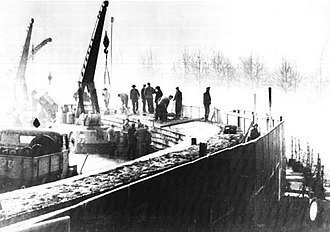 This assistance was described by historian William C. Kirby as "the greatest transfer of technology in world history". 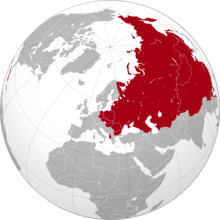 The Soviet Union spent 7% of its national income between 1954 and 1959 on aid to China. On his 1954 visit to China, Khrushchev agreed to return Port Arthur and Dalian to China, though Khrushchev was annoyed by Mao's insistence that the Soviets leave their artillery as they departed. 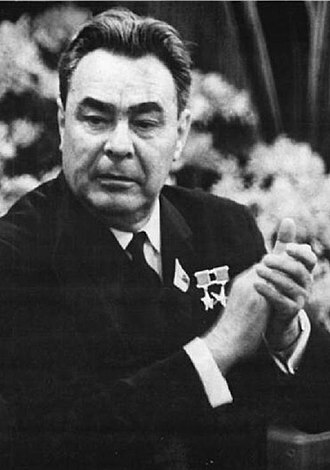 Dmitriy Feodorovich Ustinov was Minister of Defence of the Soviet Union from 1976 until his death. Dimitry Feodorovich Ustinov was born in a family in Samara. During the civil war, when hunger became intolerable, his father went to Samarkand. Shortly after that, in 1922, his father died, in 1923, he and his mother, Yevrosinya Martinovna, moved to the city of Makarev where he worked as a fitter in a paper mill. Shortly after that, in 1925, his mother died, Ustinov joined the communist party in 1927. In 1929, he started training at the Faculty of Mechanics in the Polytechnic Institute of Ivanovo-Voznesensk, Ustinov was transferred to the Moscow Bauman Higher Technical School. Then, in March 1932, he entered the Institute of Military Mechanical Engineering in Leningrad from where he graduated in 1934, afterward, he worked as a construction engineer at the Leningrad artillery Marine Research Institute. In 1937, he was transferred to the Bolshevik Arms Factory as an engineer and he became the director of the Factory. 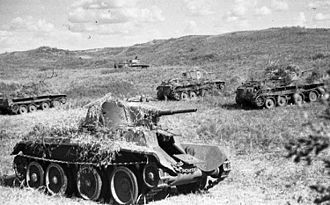 At the time of the Nazi invasion of the Soviet Union, in June 1941, from this position, he supervised the massive evacuation of the defence industry from the besieged city of Leningrad to east of the Ural Mountains. 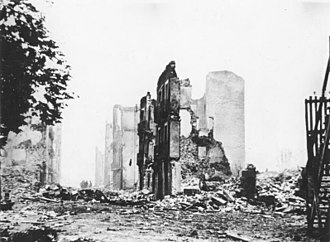 Over 80 military industries were evacuated that together employed over six hundred workers, technicians. 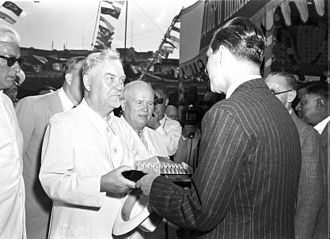 Stalin rewarded Ustinov, whom he called the Red-head, with the Soviet Unions highest civilian honour, Hero of Socialist Labour. 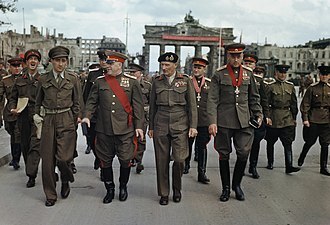 After the war was over, Ustinov played a role in requisitioning the German missile programme, developed during World War II, as an impetus to the Soviet missile. 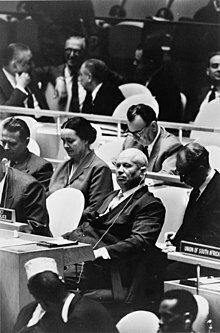 In 1952, Ustinov became a member of the Central Committee, in 1957, he was appointed as a Deputy Premier of the Soviet Union and became chairman of the Military-Industrial Commission. 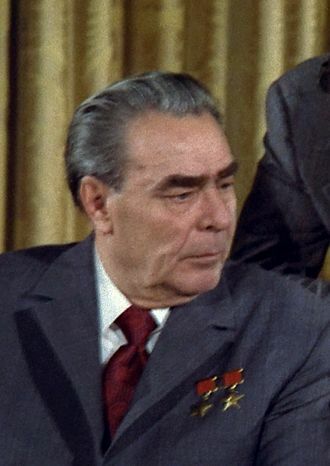 Leonid Brezhnev took power after the ousting of Khrushchev, and Ustinov returned to the defense industry, in 1965, Brezhnev made Ustinov a candidate member of the Politburo and secretary of the Central Committee with oversight of the military, the defense industry, and certain security organs. A total of 26 individuals had held this post,18 of them held other posts simultaneously with their First Deputy Premiership. 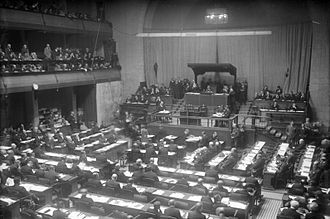 The first officeholder was Valerian Kuibyshev, who was inaugurated in 1934 as First Deputy Chairman of the Council of Peoples Commissars, lavrentiy Beria spent the shortest time in office and served for 113 days. A First Deputy Premier was usually given responsibility over one specific area, for example, Kirill Mazurov was responsible for industry, and Dmitry Polyansky was agriculture. 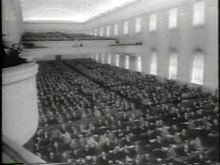 However, after Polyanskys departure in 1973 Mazurov was left the sole First Deputy Premier until Tikhonov was appointed in 1976, an officeholder could be responsible for coordinating the activities of ministries and state committees and other subordinate bodies of the Council of Ministers. If the Premier could not perform his duties one of the First Deputy Premiers would take on the role of acting Premier until the Premiers return. 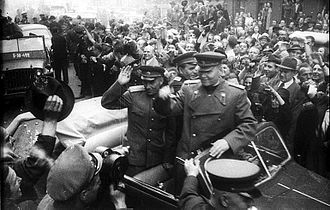 During the late 1970s, when the health of Premier Alexei Kosygin deteriorated, Nikolai Tikhonov, when Tikhonov took command of the Soviet economy, Kosygin served in a standby role. They are featured in the non-Slavic Kazakhstan, Uzbekistan, Turkmenistan as a result of the expansion of Russia and the result of Russification. As with most cultures, a person has a name chosen by the parents. First names in East Slavic languages mostly originate from two sources, Orthodox church tradition and native pre-Christian Slavic lexicons, all first names are single, non-doubled. Doubled first names are a very rare foreign-influenced instance, most doubled first names are spelled with the dash. Being highly synthetic, Eastern Slavic languages treat personal names as grammatical nouns and this auxiliary stem may be identical to the word stem of the full name while most names have it derived unproductively. Most commonly, Russian philologists distinguish the forms of given names, The short name, historically half-name, is the most simple. Some names, such as Zhanna, etc. do not possess short forms, in the latter case, one form is usually more informal than the other. Diminutive forms are produced from the name by means of various suffixes. Unlike the full name, a diminutive name carries a particular emotional attitude, depending on the nature of this attitude, nameforms can be subdivided in three broad groups, affectionate and slang. Typically formed by suffixes -еньк-, -оньк-, -ечк-, -ушк and it is often used to address children or intimate friends. Within a more official context, this form may be combined with honorific plural to address a female colleague. Colloquial diminutives are derived from short names by means of -к- suffix, expressing a highly familiar attitude, it may be considered rude or even pejorative outside of friendly context. Slang forms mostly exist for male names, being produced though suffixes -ян, -он and these suffixes give off the sense of male brotherhood once expressed by patronymic-only form of address in Soviet Union. 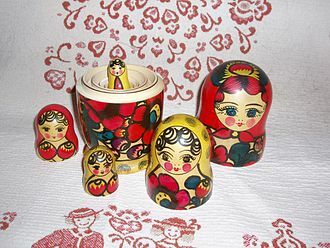 Originating in criminal communities, these came into wide usage in Russia in the 1990s. During the days of revolutionary enthusiasm, as part of the campaign to rid Russia of bourgeois culture, there was a drive to invent new, as a result, a large number of Soviet children were given unusual or atypical names. Alexei Nikolayevich Kosygin was a Soviet-Russian statesman during the Cold War. 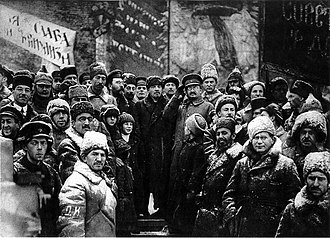 Kosygin was born in the city of Saint Petersburg in 1904 to a Russian working-class family and he was conscripted into the labour army during the Russian Civil War, and after the Red Armys demobilisation in 1921, he worked in Siberia as an industrial manager. Kosygin returned to Leningrad in the early 1930s and worked his way up the Soviet hierarchy, during the Great Patriotic War, Kosygin was a member of the State Defence Committee and was tasked with moving Soviet industry out of territories soon to be overrun by the German Army. He served as Minister of Finance for a year before becoming Minister of Light Industry and later, Stalin removed Kosygin from the Politburo one year before his own death in 1953, intentionally weakening Kosygins position within the Soviet hierarchy. 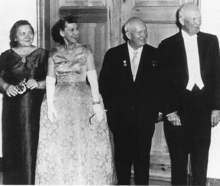 After the power struggle triggered by Stalins death in 1953, Nikita Khrushchev became the new leader, on 20 March 1959, Kosygin was appointed to the position of Chairman of the State Planning Committee, a post he would hold for little more than a year. 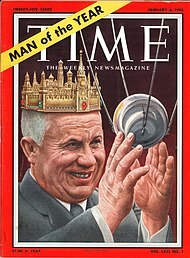 Kosygin next became First Deputy chairman of the Council of Ministers, when Khrushchev was replaced in 1964, Kosygin and Leonid Brezhnev became Premier and First Secretary respectively. Kosygin, along with Brezhnev and Nikolai Podgorny, the Chairman of the Presidium of the Supreme Soviet, was a member of the newly established collective leadership. This reform, along with his open stance on solving the Prague Spring. More conservative members of the top leadership saw some of Kosygins policies as too radical, by the 1970s, Brezhnev had consolidated enough power to stop any radical reform-minded attempts by Kosygin. In 1980, Kosygin retired from due to bad health. Kosygin was born into a Russian working-class family consisting of his father and mother, Nikolai Ilyich and Matrona Alexandrovna, the family lived in Saint Petersburg. Kosygin was baptised one month after his birth on 7 March and he was conscripted into a labour army on the Bolshevik side during the Russian Civil War. 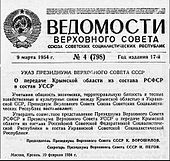 After the Red Armys demobilisation in 1921, Kosygin attended the Leningrad Co-operative Technical School and found work in the system of consumer co-operatives in Novosibirsk, Siberia. 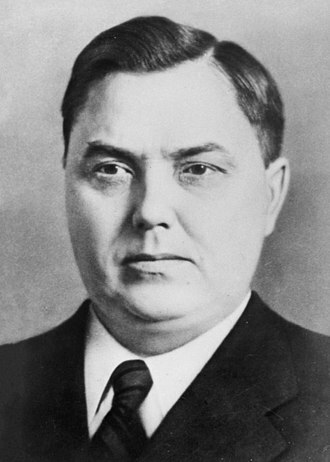 Georgy Maximilianovich Malenkov was a Soviet politician and Communist Party leader. 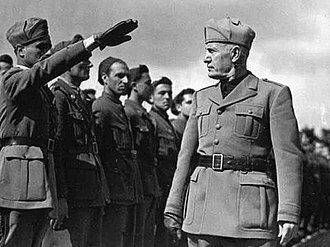 His family connections with Vladimir Lenin sped his promotion in the party and this brought him into close association with Joseph Stalin, and he was heavily involved in the purges of the 1930s. 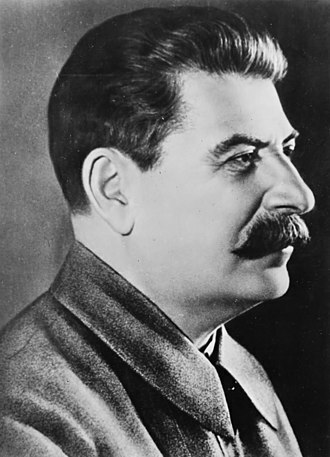 During World War II, he was given responsibility for the Soviet missile program. His two-year term ended in failure and he was expelled from the Politburo in 1957. In 1961 he was expelled from the party and exiled to Kazakhstan, Malenkov was born at Orenburg in the Russian Empire. His paternal ancestors were from the area of Ohrid, in the Ottoman Vilayet of Manastir, some of them served as officers in the Russian Imperial Army. 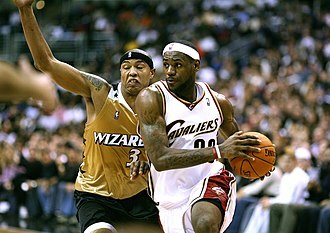 His father was a farmer in Orenburg province. 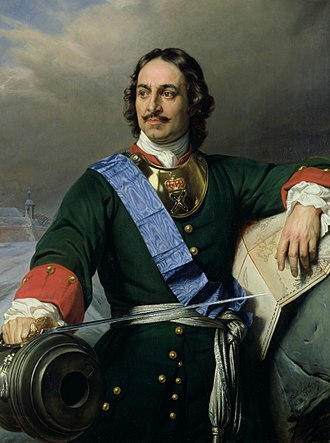 Young Malenkov occasionally helped his father to do business selling the harvest and his mother was the daughter of a blacksmith and the granddaughter of an Orthodox priest. 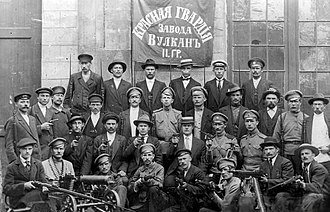 He joined the Communist Party of the Soviet Union in 1920, Golubtsova and Malenkov never officially registered their union and remained unregistered partners for the rest of their lives. Valeria Golubtsova joined the Soviet Communist Party in 1920 and her personal views were described as anti-semitic by her co-workers. 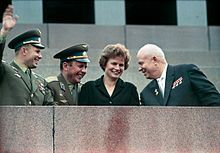 This connection helped both Golubtsova and Malenkov in their communist career, Golubtsova was the director of the Moscow Energy Institute, a center for nuclear power research in USSR. 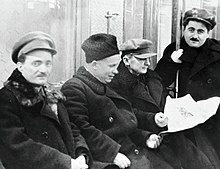 After the Russian civil war, Malenkov quickly built himself a reputation of a tough communist Bolshevik and he was promoted in the Communist party ranks and was appointed Communist secretary at the military-based Moscow Higher Technical School in the 1920s. Around this time, Malenkov forged a friendship with Vyacheslav Malyshev. 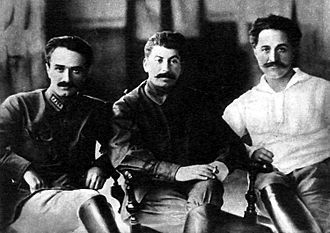 In 1924, Stalin noticed Malenkov and assigned him to Orgburo of the Central Committee of the Soviet Communist Party, in 1925, Malenkov worked in the staff of the Organizational Bureau of the Central Committee of the CPSU. Malenkov was in charge of keeping records on the members of the Soviet communist party – two million files were made under his supervision during the ten years. Kosygin visiting Toulouse in 1966. A propaganda poster promoting the reform. The poster reads, "We're forging the keys of happiness". In 1984 in East Berlin, with Erich Honecker. 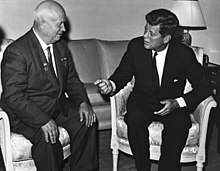 Khrushchev chaired the Presidium from 1955 to 1964. 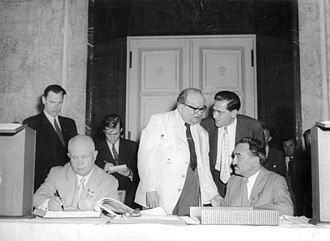 Brezhnev succeeded Khrushchev in 1964, and chaired the Presidium until 1982.